There are times when the writing flows, and other times when it’s as slow and laborious as wading through treacle. I confess I’m feeling particularly unfocused at the moment, and although I try to adhere to the maxim of writing something every day, I keep finding myself going up blind alleys; nothing is really grabbing my imagination that much. They say a little knowledge is a dangerous thing; part of me misses the days when I was typing away in blissful ignorance, going wherever my imagination took me. Now I know about the three-act structure, characterisation, plot development, visual grammar etc etc, I’m finding it much harder to imagine stories that will also work effectively within this structure. I know my writing’s stronger for having learned these things, but at the same time, I’m much more aware of the difficulty of what I’m trying to achieve, and at times that can feel more like a burden than a help. I guess in general, developing stories and writing film treatments is something I’ve always find hard. I want to create something that’s emotionally engaging, with fascinating characters driven by powerful desires but which is also magical and visually gorgeous. Something that’s original and surprising, but also believable and rooted in real human experience. I don’t find it particularly hard to come up with a basic premise for a story; a character with a powerful desire who must battle contrary forces to achieve their goals and who changes along the way. But imagining all the details of a credible journey for that character, with a growing sense of jeopardy, which is real, consistent and meaningful in the context of the imagined world and which culminates in a suitably mind-blowing climax – that’s really hard. Or at least I find it is. It doesn’t help that writing’s a lonely business; it’s all too easy to start feeling completely isolated and cut off from the real business of life. When you’re sitting alone gazing at a blank computer screen, it isn’t long before doubt seeps in and you start questioning everything you’ve written. Having someone around to pitch ideas too, or talk through a particular problem can really help. Even the presence of others near at hand somehow makes the whole business seem less remote. A lot of teachers are on strike today, meaning my kids have got a bonus day off. Having my daughter and her friends chattering and laughing in the next room is actually a comfort, rather than a distraction. Then there’s the question of what happens when you do finish a script. Increasingly, the advice is to grab a cheap camera, or even just an I-phone, and go out and make a film yourself. One of the great miracles of modern technology is that this is now possible. These days, film-making is more accessible to more people than ever before. For the first time ever, you can shoot a film and air it without needing a huge production budget, or at least rich parents. I truly welcome this revolution, but at the same time, it scares me. I grew up at a time when personal computers where just beginning to be available and the internet was little more than a twinkle in Sir Tim Berners-Lee’s eye. Completely self-taught as most of my generation are, I manage to find my way around a few basic programmes. When it comes to gadgets, I tend to use their simplest, most basic functions and shy away from the whizzier things they can do. Apps remain pretty much a closed book to me. I know I need to suss all this stuff out. I know I should be borrowing the daughter’s I-phone, shooting my own scripts, editing them and putting them up on You-tube, but actually, all I really want to do is write! Who might benefit from this post? Anyone who writes poetry, flash fiction, short stories, novels, articles, letters … well, you get the idea. If fellow readers and writers respond, we will all benefit. Why am I initiating this now? I haven’t done a writing course. 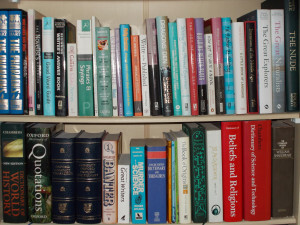 I learned through experience how to build my collection of resource, or reference books, and I’d like to help other writers by suggesting a simple list of books. It may be that some writers don’t feel they need them all, but having a proposed selection is always a good thing. After reading this post, you might like to join the team; let’s work together and help each other to succeed. Tough week? Looking for an easily digestible slice of cinematic entertainment – something warm and gooey that will leave you with a soft fuzzy feeling as you step out of the local multiplex into the cold night air? If so, Jonathan Glazer’s Under The Skin probably isn’t the film you’re after. That said, this is without question the best film I’ve seen so far this year. It tells the story of Laura, an alien, played by Scarlett Johansson, at large in modern-day Glasgow where, disguised as an alluring young woman, she hunts for human prey. She’s supported by a squadron of bikers who police her actions and tidy up any loose ends that might betray her. The film opens with the construction of the simulated eyes through which Laura will view the world and at no stage does the film deviate from her perspective. Insulated in her white van, she prowls impassively for victims, as the busy city bustles and flows around her. In these sequences, Glazer used secret cameras to capture ordinary members of the public going about their daily lives, oblivious both to his intentions as a director and to the intentions of his extra-terrestrial heroine. As a distancing technique, this works incredibly well, enabling the audience to share the central character’s perception of human activity as remote and impenetrable. At times, it feels as if we’re viewing ants swarming over an anthill. The implications of Laura’s other-world alienation are soon forcibly brought home in a breath-takingly charged scene at a remote beach where a family tragedy unfolds before her uncomprehending eyes. Then gradually something begins to change. An unlooked-for gift of flowers brings with it a troubling touch of wet, red blood. She becomes curious. In another scene, the Laura encourages her latest victim, a young man with neurofibromatosis, to reach out to her with the words, “when was the last time you touched somebody?” The moment that follows is excruciatingly tender, full of the young man’s incredulity and longing, so when the time comes for Laura to finish him off, she’s unable to go through with it and he escapes her clutches. Having broken the rules under which she’s operating, she’s left with no choice but to run from her minders. She soon realises she’s painfully ill-equipped to survive alone in the hostile terrain of the planet earth. Struggling to make sense of the human world and realising her only hope is to connect with its inhabitants, her fate is sealed by her inability to feel as humans do or read their intentions. Under the Skin is not an easy film an easy watch or interpret. Raising disturbing questions about alienation, sexuality and what it means to be human, it’s more of a film to think about and reflect on, than one to enjoy as such. All the same, as a piece of cinematic writing, it works brilliantly with a simple, yet profound story focused on a central character who is forced to change by circumstances beyond her control. The cinematography is likewise fantastic, with gorgeously luminous photography of the Scottish winter landscape intercut with terrifying images from the sci-fi lexicon, which evoke the dark, gelatinous limbo into which Laura’s victims are sucked and digested – a kind of womb in reverse. Yet even here, what survives is the human instinct to reach out and connect. All this is underpinned by a mesmerizingly beautiful sound-track by Mica Levy that brings both coherence and an eerily mysterious quality to the piece. I confess I find it immensely encouraging that films of this calibre are being made and financed in Britain. Under the Skin may not be to everyone’s taste; it’s about as far as you can get from the usual Hollywood fare. Don’t get me wrong – I love comedies and thrillers as much as the next person and sometimes a bit of mindless escapism is exactly what you need, but it’s good to be challenged, spooked and provoked too and this film does exactly that. It’s been lovely here this week – a cornucopia of crocuses, daffodils and pulmonaria bursting forth, wood pigeons squabbling in the trees over prospective mates and enough warmth in the sun to be able to sit and read in the garden. You know what I’m talking about – spring is here. It’s amazing how a few rays of sunshine can lift the spirits. I travelled into London yesterday and at Finchley Central station, a few stops down the line from where I live, one of the station employees has turned a strip of disused ground into the loveliest of gardens. Every time I rode past it last summer, it brought a smile to my face along with gratitude that someone had taken the time to dig and plant for no reward other than the pleasure of creating something beautiful. Already, the first blossoms are re-appearing in the station garden, with every sign they’ll provide just as much pleasure this year. As Camille Pissarro once said, blessed are they who see beautiful things in humble places. Usually I read on the train, but sometimes it’s just nice to reflect, maybe let an idea or problem marinate in my head and see if any solutions emerge. Giving space and time to let the subconscious mind resolve problems is really important for a writer and it took me a long time to lay aside anxieties about my work and trust in that process. I usually find it all but impossible to appraise what I’ve written with any sort of objectivity for quite some time after I’ve written it. Even re-reading some of the posts in this blog, I can see now they’re overwritten in places. Sometimes it helps to sleep on it and a new day can often bring a completely new perspective on what I was writing the day before. At times it can take much longer; on occasion, the eureka moment happens months later – sometimes too late to be useful! It’s only recently that I’ve managed to identify ways to solve problems I couldn’t really even diagnose in a screenplay, I was working on it last year. The question now is whether it’s worth going back and re-writing it from scratch, or whether it makes more sense to chalk it up to experience and start on something new. While in town, I took the opportunity to watch Wes Anderson’s Grand Budapest Hotel. It’s a carefully constructed, conspicuously artificial confection, a vertiginous cream cake of a movie always teetering under the weight of its own pretentions. Like cream cakes generally, it was a bit rich for my tastes, if I’m honest. There’s no question that the script was very witty and Ralph Fiennes was pure comic gold as the charmingly oleaginous hotel concierge, M Gustave, who’s saved by his own impeccable manners. The story, however, was completely farcical – a choux bun, containing nothing more substantial than air and as such, it totally failed to engage on an emotional level. By the end, it was all becoming a little tiresome. I found the box-in-box-in-box framing device quite annoying too. All in all, it was something of a disappointment after Moonrise Kingdom, which I loved. Congratulations to all the Oscar winners, and in particular, to Spike Jonze, who won the Best Original Screenplay Oscar for Her, and to John Ridley who won in the Best Adapted Screenplay category for Twelve Years A Slave. In the course of presenting the awards, Robert de Niro commented that, “The mind of a writer can be a truly terrifying thing – isolated, neurotic, caffeine-addled, crippled by procrastination and consumed by feelings of panic, self-loathing and soul-crushing inadequacy. And that’s on a good day.” Anyone who’s attempted to write a screenplay will know exactly what he’s talking about. Some of us are lucky enough to have the support of a loving family. All the same, there’s only so much friends and relatives can do; every dream is different and whether and how we choose to pursue our own particular nirvana is up to us alone. Earlier in the week, I took our daughter to her singing exam. She has a lovely voice – husky, soulful with a sweet thread of melancholy running through it. In other words, she has a real talent. How wonderful, you might think. For me, however, it poses a problem because she herself is not convinced. As her mother, I want her to shine. I want her to be every bit as good as she could be. I want her to nurture her talent, work as hard as she can, make the very most of it. That probably makes me sound like some sort of pushy gorgon of a parent. I have to remind myself that my role is to open the door and provide the opportunities for our daughter that will let her develop her talent herself, if that’s what she chooses to do. I can’t force her to practise more and nor can I do it on her behalf. At times, it can be maddening. On the morning of the exam, she insisted that I write in the note excusing her from classes that it was for a dental appointment, rather than a music exam. She refuses even to mention it all but her closest friends and doesn’t want me to tell my friends either. Hard as it is, I have to accept that her voice is her gift, not mine. All I can do is respect her wishes; I have no right to bathe in her reflected glory. All the same, as she continues with her lessons, she’s becoming more willing to acknowledge what she is capable of. She likes music, she likes singing. And perhaps she deserves credit for recognising that a great talent brings with it a great burden of expectation that can be hard to meet, especially when you’re very young. In addition, she’s never wanted to step ahead of her friends or do anything as vulgar as seek the limelight for herself. Whatever I might feel, that’s the person she is. I have to confess that I too find it almost impossible to tell people I’m a writer (or trying to be one). Like my daughter, it took me a long time to admit it, even to my own mother. Usually, if I mention it at all, I tell people writing is only a hobby and that I’m still looking for a “proper job” ie one that results in a pay-check at the end of the month. I too am not quite ready to expose myself to the full glare of public opinion.